These easy Mummy and Monster Dirt Cups have just a few ingredients. 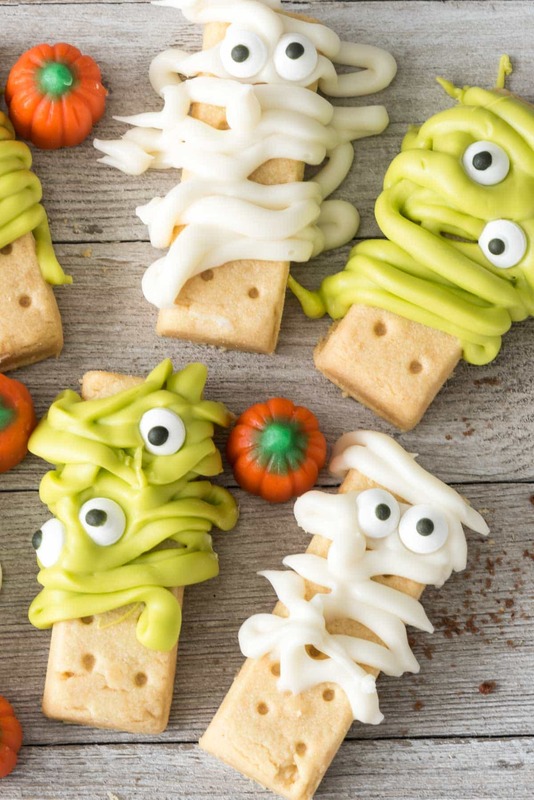 Make monster and mummy cookies out of shortbread and candy! I don’t know why I can’t get behind it as a holiday. I just…can’t. I’ve tried for years to enjoy it…but it’s just not my thing. What IS my thing? 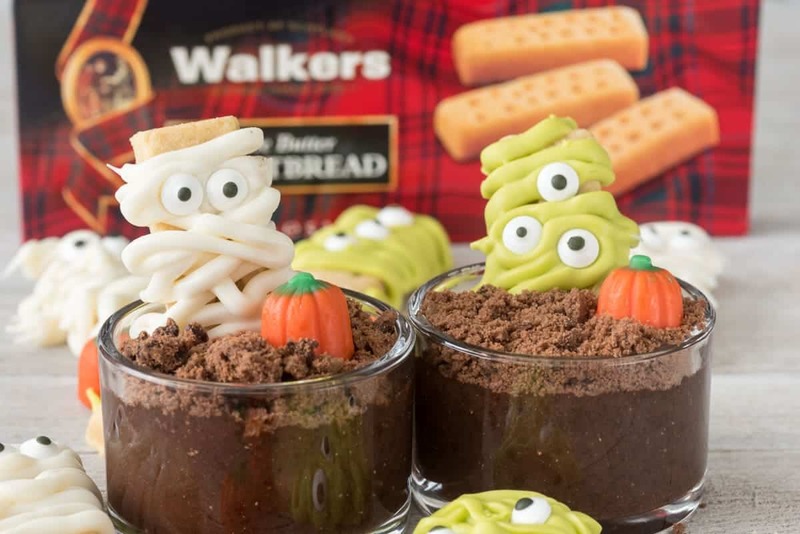 Cute Halloween food that’s supposed to be scary. Now THAT is something I can get behind. There is just something SO FREAKING CUTE about Halloween food, whether it’s eyeballs or spiderwebs or brooms or witches hats. Now, with the invention of sugar eyeballs, the cute scary factor is ratcheted up about a million notches. I had so much fun putting the eyeballs on these monsters and mummies. They look crazy and scared and not at all creepy even though if I ran into a real-life mummy or monster I would most certainly be scared. Maybe it’s the scariness of Halloween I don’t like? I never was a fan of scary movies – I’ve never seen Freddy Kruger or any of those terrifying movies they show this time of year. 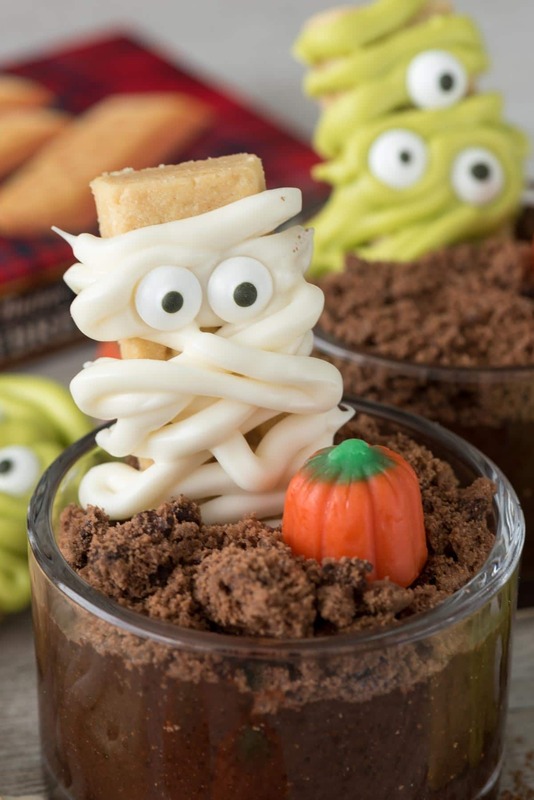 These monsters are even cuter when you add them to dirt pudding cups. What kid (or adult) doesn’t like a dirt pudding cup? 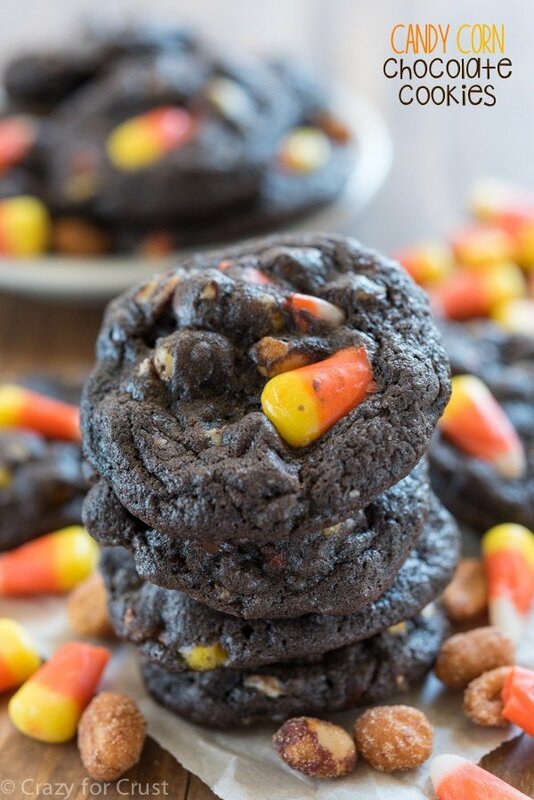 These cookies couldn’t be easier to make. They start with Walkers Shortbread. You can use the Shortbread Fingers or the Mini Shortbread Fingers, whichever you like best. Walkers is my favorite shortbread – it’s so buttery and has the perfect flavor because it’s totally pure. Once you have your cookies, you just need candy to make the mummies and monsters. I used white candy melts for the mummies and green for the monsters. Melt the candy and drizzle it over the shortbread, placing eyes as desired. (Find the colored candy melts and eyeballs in the baking section at any craft store or Walmart.) Once they’re chilled you have a super cute cookie you can wrap up and give or put out at a Halloween party. Dirt cups are the easiest and oldest treat: chocolate pudding (either from a box or from those cups you get at the store) covered in cookie crumbs. I used another Walkers favorite, the Chocolate Scottie Dogs. 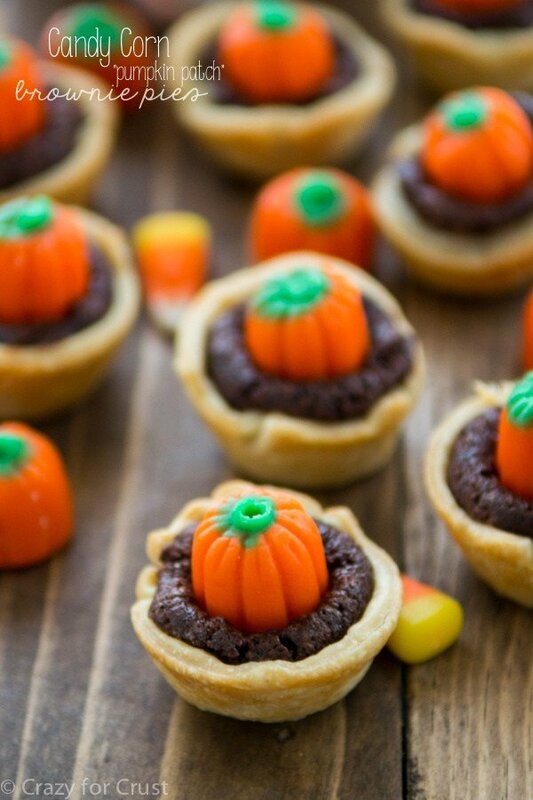 These will be such a cute treat for a class party or a Halloween potluck. I may actually make one for myself on Halloween (but I’ll add Baileys because it will make the horror of the holiday easier). Lay cookies out on a parchment paper or wax paper lined cookie sheet. Melt candy according to package directions, adding some shortening or oil to help aid in melting if needed. Place melted candy in a sandwich bag and cut off one tip. Pipe the candy over the cookies, making them look like monsters or mummies, as shown. Add eyeballs as desired. Chill to set. Store in refrigerator. Do not place the cookies in the pudding until you're ready to serve them. This post has been sponsored by Walkers Shortbread. All opinions are 100% my own. I’m a Halloween hater too. I mean, I don’t like being scared. I’m scared enough. Why make it worse? And all the creepy costumes. With all the clown crap going on, we don’t need more of that. I’m okay with adorable monster snacks, though. So you’re doing great there. I love these! My sister’s fiance and I were just talking about how things are just funnier with googly eyes attached to them. These little treats are no exception and I’m sure if I had a kid they would go bonkers over these. I can get down with a delicious dirt cup though! These are so cute!! I admit, I don’t make cute food because I don’t have the patience! I love Halloween, maybe because I had so many siblings and neighborhood kids to trick or treat with (we NEVER had any parents with us). These treats are adorable – I’m not a crafty type, so I need your good ideas! Think all the recipies are so cute. I go to Arizona for the winter.It’s fun to see how surprised when we take them to pot luck . Or for a card day. These are adorable!! I am all about cute Halloween food. 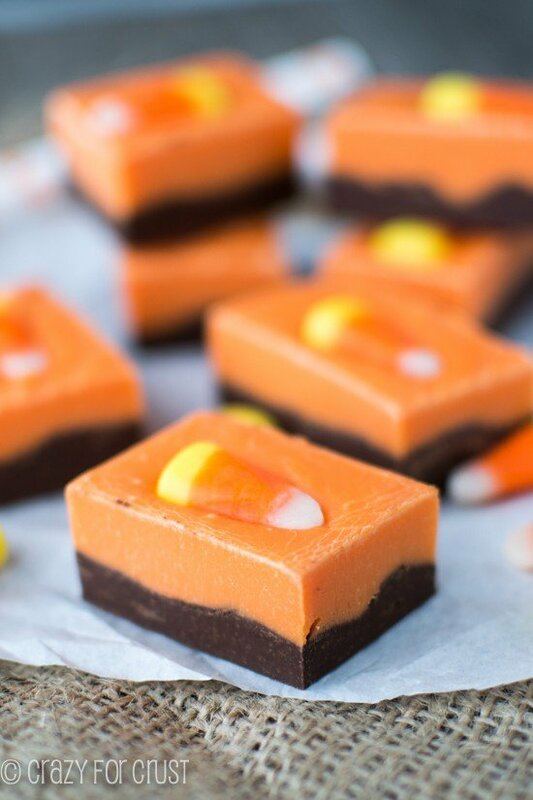 I just don’t do gory or grotesque Halloween food, and that’s why these are right up my alley! So cute. Member when I ate like 14 of those shortbreads in a row? I can’t even handle the idea of frosting on top. These are SO CUTE! Ha, I have a huge stack of shortbread to bring you Monday!!! I’m the same way about Halloween ! I take one doenthe team , but it’s not my thing … neither are scary movies! These cups are so adorable they may change my mind about Halloween! So creative! These are too cute! Having to deal with a tired kid all week wouldn’t make me excited for Halloween either!